Please note that in a project site, you must manually add all users. Note: For Individual Manual Enrollment and Self-Enrollment methods, participants must have an active UCSBnetID and have logged in to GauchoSpace at least once. * For new users, logging in to GauchoSpace once creates their GauchoSpace accounts and adds them to the GauchoSpace user database. This does not need to be done for Bulk manual enrollment, as this tool creates the account for the user upon upload. This method requires you to search for each person and add them individually using the search box in the Add User/Assign Roles tool. This is the preferred method for adding a small number of users. 3. In the text box, click Add UCSB User/Assign Roles. 4. In the Search box in the bottom right corner, enter the user's name, UCSBnetID, or UCSB email. 5. Click the name of the person you want to add to highlight it. 6. Choose the desired role from the drop-down menu in the center (default is student). For more information on roles, please see this Help Center article on assigning roles in GauchoSpace. This method requires you to enter a list of the UCSBnetIDs or Perm Numbers for everyone being added to the course. This is the preferred method for adding large numbers of users, especially after a quarter has started. 1. Prepare a list of UCSBnetIDs or perm numbers for the participants you wish to enroll. 2. Log in to GauchoSpace and enter your course site. 3. In the UCSB Course Tool block, click on Add User/Assign Roles. 4. Underneath the text box, click the link for Bulk Enroll Students. 5. From the drop-down menu, select whether you will enter UCSBnetIDs or Perm Numbers. 6. Copy and paste your list of UCSBnetIDs or Perm Numbers into the "List" box. You must separate each entry by a comma, tab, or line break. If you are copying and pasting from an Excel Spreadsheet, there will already be line breaks in your list. 7. Click Enroll Users at the bottom of the screen. 8. You will be taken to a confirmation screen showing your users have been added to your course site. You may enroll more users, or go back to the course using the buttons below. This method allows users to add themselves to the course site via a link. This is the preferred method if your participants have not logged into Gauchospace before in order to create their accounts, and you want users to add themselves to the course site via a link. 1. Enable self-enrollment by activating course crashers. 2. Give your participants the course URL link. You can find the URL in the address bar of your browser. 3. Your users will click on the link and see a page where they will self-enroll. 4. Once they have clicked the button to "Join this course site", they will automatically be added to your Enrolled Users list as a course crasher and will have access to the site in whatever role you selected in the first step. Next to Allow new enrollments, select Yes from the drop-down menu. Note: You can limit the amount of time a student is enrolled in the course by changing the settings for enrollment duration. You can also change the assigned role and have multiple types of enrollment methods. A non-UCSB user is someone without a UCSBnetID. This method requires you to enter the email, first name, and last name of the person you wish to add. Important Note: Only participants with the following account credentials are able to add non-UCSB users: Instructor of Record, Employee of UCSB, Using a UCSBnetID to access GauchoSpace. 2. 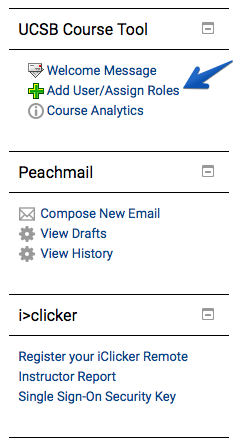 In the UCSB Course Tool block, click Add User/Assign Roles. 3. Under the text box, click Add Non-UCSB User. 4. Enter the email, first name, and last name of the person you wish to add. Double check that there are no spelling errors and that there are no extra spaces before or after the email address. 5. Select the desired role for the Non-UCSB User by selecting either Student or Course Visitor. You can find more information about these roles by visiting this Help Center article about participant roles. 6. Click the Add Non-UCSB User button. 7. GauchoSpace will then send an email to the address you provided. The Non-UCSB user will need to open the email and follow a link to confirm that the email address is valid. They will then be asked by GauchoSpace to create a password before logging in.